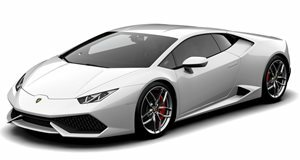 Stunning baby Lambo also boasts Performante performance. Arguably one of the most alluring colors offered by Lamborghini and one of the best supercar shades period, Blu Cepheus looks absolutely sublime on this modified Huracan. Created by 106 Industries, the photoshoot of the baby Lambo took place in the vicinity of Miami International Airport and the results are fantastic. Married to the striking body color is the tuner’s “Renato” carbon-fiber aerodynamics package that adds a new front spoiler, side skirts, an aggressive rear diffuser and a contoured rear wing. If you think the body kit is trying to imitate the new Huracan Performante, which was unveiled at the Geneva Motor Show last month and set a new Nurburgring lap record, then it won’t surprise you to discover that the tuning company has upped power accordingly. Courtesy of a custom ECU tune, the Huracan’s 5.2-liter V10 has been boosted by 30 hp and 35 lb-ft of torque, giving it a total of 640 hp and 448 lb-ft. That’s practically identical to the Performante’s output figures. Whether it can match its performance specs of 0-62 mph in 2.9 seconds, 0-125 mph in 8.9 seconds, and a top speed of 203 mph remains unknown, but there’s a very good chance it will come close to those numbers.